Steam has decided to refocus upon games and software. In a blog post Valve spells out that this decision means it has retired the Video section of the Steam Store. If you already bought a video or two via the Steam Store, please don't worry, as they will still be available to you. We foresaw the move to expand the Steam Store into audio visual content back in 2014, when a beta version added several new application-type IDs including; films, TV series, videos, and music. Valve went on to make available several documentaries, TV series and even Hollywood blockbusters direct to Steam users. 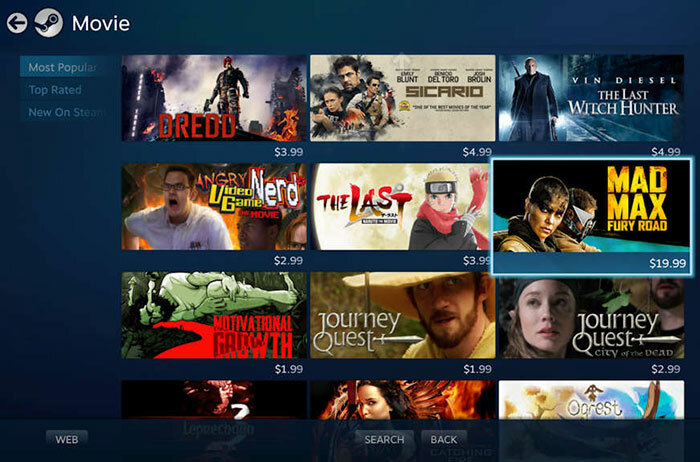 The streaming video and movies content strategy came to light around the same time that the ill-fated Steam Machines venture wasn't yet ill-fated. Valve strategists were probably dreaming of Steam Machines in every home, playing games, videos, music, and more - as essential elements of modern home entertainment systems. The removal of the Steam Video section from the store menu doesn't mean that there will no longer be any video available to buy/watch via this portal. Instead, Valve will host any videos relevant to particular games on their respective store pages, and/or they will be discoverable via the search function. Any remaining, existing, or new videos will be focussed upon gaming. Non-game related content will be removed from the store, so it won't be purchasable over the coming weeks. Valve is increasingly under pressure from new games stores on the PC, so refocusing on its core appeal may help it hold strong against the likes of the new Epic Games Store. In related news, Razer recently announced it was closing the Razer Game Store after less than a year (launched April 2018, will close on 28th Feb 2019). I bought one, but only because it was a game tie-in, both of which costs about a Dollar. The problem was the excessive cut Steam take. So you buy a PC or video / music - expensive. The very low level stuff was priced higher than mid to high tier, then delivery costs too, which were very excessive. Not only was it never really fully supported, but I think they were barking up the wrong tree entirely. I have only known Steam for Games. With enough marketing and options it could of done it. It lacked too many features to compete with Netflix etc. Amazon only sold books and now sells everything, proof it can be done. But as with most things timing plays a big part too.